When I read the book of Joshua that’s what I think about, the land that God promised to them many years ago and now it was time for them to enter into that land of promise. However, as they prepare there must be an understanding that there will be battles that will have to be fought. Therefore, in the midst of the battles, there is always hope for victory, Rom. 8:31, 37. In fact, the Bible tells us that we are the recipients of victory through the Lord Jesus Christ, 1 Cor. 15:57. While we are engaged in the battle with evil, there is the expectation that we can and will walk in victory in our lives. For me, this is what the book of Joshua represents. In this book, we find that Moses, has died and a new leader named Joshua has been appointed to lead the nation of Israel into Canaan. After 40 years of wandering in the wilderness, Israel is about to take possession of the land which God promised Abraham. This book is about the battles Israel faced in order to claim that promise from God. Joshua is a book of warfare, suffering and great victories. It is a book that can teach the Christian much about obtaining spiritual victory in your life. This morning, I begin a new series that will take us through the book of Joshua. My goal in preaching it is help you to stop wandering around in the wilderness and to enter into your Canaanland of spiritual victory. These verses will help us to understand what it takes to go from wandering around in a wilderness of defeat to living in a land of victory. In Verse 1-9 we see THE CALL FROM GOD. In order for them to enter the land they must get instructions from the one who gave them the land. In verse 1-4 there is A Call To Claim The Land – In these verses, Joshua is reminded that the Lord has already given the land of Canaan to the children of Israel. Joshua is commanded to lead the people into Canaan to claim the land that they had been promised by the Lord. The land was given to them back in Gen. 12:7 and the promises were reaffirmed to every succeeding generation of the nation of Israel. The land was indeed their land! There was no need for them to continue their wandering around in the wilderness. They had a land, all they had to do was claim it. Each day as I look around as I go through my week I see Christians who are defeated, who struggle with sins, who, for all intents and purposes are wandering around in a spiritual wilderness. My friends, it does not have to be that way! God has a place of victorious living which He has promised you and I can live in, 2 Cor. 2:14; Rom. 8:37; 1 Cor. 15:57. I believe with all my heart that God did not save you to see you defeated! Most of the time, we are defeated because we refuse to walk in victory. There was the promise of victory over every enemy, the promise of the presence and power of God, the promise of the faithfulness of God, the promise of absolute victory and the promise of God to keep His promises. The question is what did Joshua have to do to make these things happen? Just one thing: Trust God! May I remind you that the same promises God made to Joshua are in force for you and me this morning? You can still count on the Lord to do everything He promised Joshua He would do! He still gives victory over all our enemies – 1 John 5:4-5. 4 For whatsoever is born of God overcometh the world: and this is the victory that overcometh the world, even our faith. 5 Who is he that overcometh the world, but he that believeth that Jesus is the Son of God? He is still ever-present, Heb. 13:5, I will never leave thee, nor forsake thee. and all powerful – Matt. 28:18. And Jesus came and spake unto them, saying, All power is given unto me in heaven and in earth. He is still faithful – Matt. 28:20. I am with you always, even unto the end of the world. Amen. He still gives absolute victory – 1 Cor. 15:57; But thanks be to God, which giveth us the victory through our Lord Jesus Christ. He still keeps His promises – Rom. 4:21. And being fully persuaded that, what he had promised, he was able also to perform. What do we have to do to see these things come to pass in our lives? Just one thing: Trust God! In verse 7-8 we find A Call To Carry Out The Law – The Lord tells Joshua that if he is to lead the people of God to rest in Canaan, then he take heed to the Law of God. Remembering the Law is an essential step to entering our Canaan as well. Notice what the Lord to Joshua about the Law and how this applies to our lives today. He was to keep the Law, He was to meditate on the Law and He was to prosper by honoring the Law. There is a lesson in this for us this We are to feed on the Bible – Job 23:12. I have esteemed the words of his mouth more than my necessary food. We are to live by the Bible – Psa. 119:11; Thy word have I hid in mine heart, that I might not sin against thee. We will be blessed when these things are true in our lives – Psa. 1:1-3! Blessed is the man that walketh not in the counsel of the ungodly, nor standeth in the way of sinners, nor sitteth in the seat of the scornful. 2 But his delight is in the law of the Lord; and in his law doth he meditate day and night. 3 And he shall be like a tree planted by the rivers of water, that bringeth forth his fruit in his season; his leaf also shall not wither; and whatsoever he doeth shall prosper. Are you standing for the Lord? Or, have you fallen out along the way? To claim the land as yours you must also look at verse 10-15 THE CHALLENGE FROM JOSHUA. After Joshua receives his challenge from the Lord, without hesitation, he goes to the people and tells them that the time has come to take their land. First, he challenges the nation as a whole and then he addresses a specific group within the nation of Israel. In verse 10-11 there is A Challenge To Readiness – Joshua tells the people to get ready to go into Canaan and claim the land. These were the words they had been living for 40 years. However, before they could go in, they had to get ready! God told them to prepare them some food. You see, the manna was about to stop. God had told them that He would give them manna while they were in the desert, but it would cease when they entered the Promised Land, Ex. 16:35. The manna was desert diet, now they were about to move up to something a whole lot better. They were going to a land flowing with milk and honey. What had worked in the wilderness would not suffice in the land of blessing! What will you have to do to get ready for Canaan? In verse 12-15 there is A Challenge To Responsibility – Now, Joshua addresses the tribes of Reuben, Gad and that half tribe of Manasseh. These tribes had sought, and gotten, permission from Moses to remain east of the Jordan, just outside the Promised Land. Their reason in making this request? 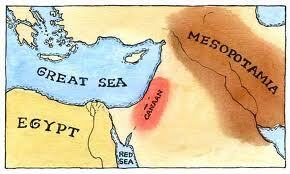 The land east of Jordan was a land that was good for raising cattle, Num. 32:1, 4, 16. Still, Joshua reminds them that they had promised to fight alongside their brethren until the land was conquered, Deut 3:12-20. These people are challenged to remember their promise and to aid the nation until victory was secured. While these people settled in a land of prosperity, they were also in a land of danger. Years later, when the Assyrian army attacked from the East, these tribes were the first to go away into captivity. Listen, there is a very powerful lesson for us in these verse. We have literal legions of Christians who are just like these 2 ½ tribes. They are more concerned about making a living than they are about making a life! The primary thing that motivates them is getting ahead in life. In other words, they are materially minded instead of spiritually minded! These people represent those Christians I would call “borderline Christians”. These are people who have trusted Jesus for salvation, but that is about as far as they are will to go. They will come when they want to, tithe when they feel like they can afford to, fight a battle now and again, but most often, they are seen just playing around the edges, refusing to put God first in their lives. By the way, it is this type of Christian who is usually the first to fall in times of attack and temptation! Lastly, take a look at verse 16-18 THE COMMITMENT FROM THE PEOPLE. In verse 16 They Commit Themselves To A Life Of Surrender – These people make their stand with the Lord. They promise absolute obedience and surrender to the will of God. This is the only way spiritual victory will come to any life. There must be total and absolute surrender of every area of life to the will of God and to His divine leadership. Anything less hinders the work of God in your life and mine. What are you holding back from the Lord this morning? Finally, verse 18 shows us They Commit Themselves To A Life Of Separation – Finally, the people commit themselves to separating from those in their midst who refused to comply with the commandments of the Lord. And, their separation was so strong that they vowed to put to death anyone who rebelled against the leadership of Joshua. These people knew that allowing rebellion in their midst was a sure way to guarantee defeat. Again, the lesson for us is clear this morning. If we want to walk in victory, we must practice separation in our lives as well. We should separate ourselves from anything that would prevent us from having victory in our lives. Whether it be from certain people, in the way we dress, the way we talk, the things we watch and do, where we work, how we think or in any other area of life. If it is a hindrance to your entering into your Canaan, then it must go. Otherwise, you will always be defeated and in danger. Even as I speak, you already know what it is that is holding you back this morning. You need to get that things settled today! Canaanland is our land! It has been given to us by the Heavenly Father and all we have to do this morning is to march in and claim it for ourselves. However, while it is ours, it isn’t cheap! If you really want to walk in spiritual victory and live in Canaanland, then you will have to pay the price.